We are in a way for the cosmos to know itself. Where we have strong emotions, we’re liable to fool ourselves. The universe is a pretty big place. If it's just us, seems like an awful waste of space. The Earth is a place. It is by no means the only place. It is not even a typical place. We grow up in isolation. Only slowly do we teach ourselves the Cosmos. Sceptical scrutiny is the means, in both science and religion, by which deep insights can be winnowed from deep nonsense. In the fabric of space and in the nature of matter, as in a great work of art, there is, written small, the artist’s signature. 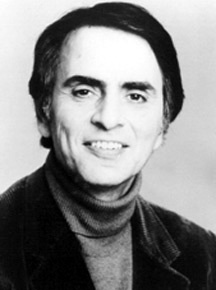 Carl Sagan was an American astronomer, astrophysicist and author. He is widely known for his books and his narration of the tv series Cosmos.